Dubai provides best business and job opportunities among all the emirates of UAE and also one of the best in the world. It is the reason that entrepreneurs and job seekers are heading towards Dubai from all corners of the world. The job seekers will get great advantages while working in Dubai that are perhaps not available anywhere else in the world. They will get tax-free salary, complete security, high lifestyle & comfort, better job prospects, global exposure along with numerous other benefits. Like many other processes, starting a job also has a definite process in Dubai. 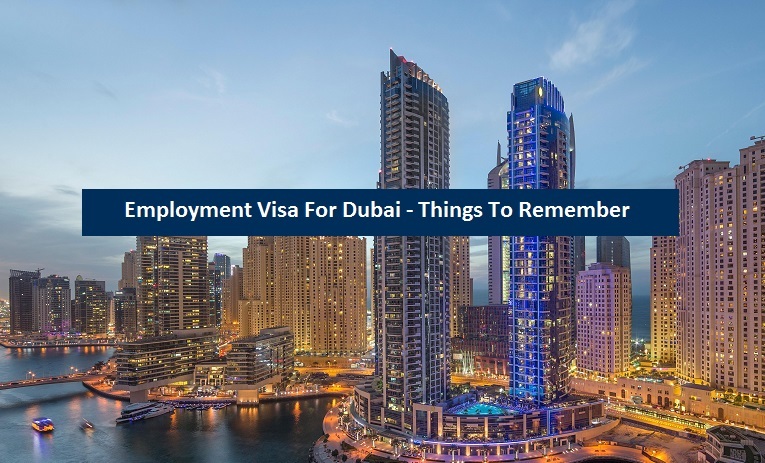 Initially, you will get a written job contract or job offer letter from your new employer in Dubai and your employer will start the mandatory paperwork for your employment visa. The employer will sponsor you by paying the employment visa processing fee. After verification of the papers submitted by your employer, the immigration department of UAE will contact you. After that, you will be allowed to enter UAE. In the first step after entering Dubai, you will have to prove your health status by taking health card from the Department of Health & Medical Services. You will submit two passport size photos, passport copy, employment visa application, written job offer verification and medical certificate (proving you are free from HIV, TB and Hepatitis C) to get a health certificate. This initial step is mandatory for foreign employees and getting employment visa without health card is not possible. Now, you will submit necessary documents to obtain labor card from Ministry of Labor Office Dubai. This will include one passport size photo along with photocopies of employer’s labor license, entry visa, medical records and employment contract. In the next step, the foreign employee will apply for residence visa. For this purpose, the residence visa application and necessary documents (photocopies of labor card, two passport size photos, original health certificate, original passport and original entry permit) will be submitted to the Dubai General Directorate of Residency & Foreign Affairs that will later issue the residence visa. On the basis of employment visa, the foreign employee can stay in Dubai for 60 days during which the job providing company will complete the whole medical and residential procedure of the employee. It is important to note that there are several categories in employment visa and there is different fee structure for all these categories. If you are one of those who want to take advantage of the lucrative job opportunities available in Dubai and also desire to complete the whole employment visa process with ease and comfort, then you can contact Riz & Mona Consultancy. We are a Dubai-based firm that provides services of visa approval process through our experienced PROs. We are experienced in providing services for all type of visa services in Dubai including employment visa along with partner visa and family visa. You can talk to us via our landline # 971-4-5586339.